The Group Managing Director and Chief Executive Officer, Skye Bank Plc, Mr. Kehinde Durosinmi-Etti, has assured investors that banks in the country are ready to support them if they desire to invest in the hospitality sector. Durosinmi-Etti gave the assurance at the opening of Intercontinental Hotels, Lagos, recently. 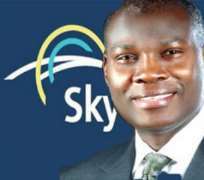 According to a statement on Thursday, the Skye Bank boss noted that the environment was ripe for investment in the hospitality industry and the banks were on hand to encourage both local and foreign investors in the sector. He said, 'Our doors are always open to investors with projects like this that will boost the economy and provide employment for the teeming population of Nigeria. The Chairman, Milan Group, Ramesh Valechha, who was also at the opening, said the hotel was a commitment and right investment made in the economy of Lagos State in particular and Nigerian hospitality industry as a whole. Noting that with 650 Nigerians and 24 expatriates as employees, the hotel was poised to offer world-class hospitality services and professional training that would ensure new career paths in the hospitality industry. The Regional General Manager, Africa, Intercontinental Hotels Group, Karl Hala, said he was glad that the hotel, the first of the group's property in West Africa, whose partnership agreement started in 2000, was now ready for everyone to enjoy.